On Sunday 25 September Nabeel Rajab was transferred from the West Riffa Police Station to solitary confinement in the East Riffa Police Station ahead of his sentencing next week. “It’s been over a hundred days since Nabeel was arrested and charged and am very worried about his well-being. He has been treated harshly and sent back to a place where he suffered complete isolation in facilities not fit for purpose,” Sumaya Rajab, Nabeel’s wife, said. The last time the 2012 Index on Censorship award-winning Rajab was held in East Riffa, he required urgent medical care after two weeks of isolation in deplorable conditions. The president of the Bahrain Center for Human Rights faces up to 15 years in prison on 6 October on three charges related to his posts on social media. Rajab is currently being held in a filthy cell. He has not been given a reason for his transfer, and when he tried to ask a police officer, he was screamed at and insulted. When his family delivered clothes and toiletries to the station, officers dirtied them with water and soil before giving them to Rajab. The police officers refused the family’s attempt to give Rajab a radio. Rajab’s continued detention in police stations is extraordinary. Male detainees are normally only held in police custody until formal charges are brought against them; they are then transferred to the Dry Dock Detention Centre for pre-trial detention. Police stations do not have the facilities for long-term detention. Rajab, who was charged a day after his arrest, has requested multiple times for his rightful transfer to Dry Dock, as has his lawyer. These requests have all been denied. Rajab has been held in pre-trial detention since his 13 June 2016 arrest. He was initially held in East Riffa. After 15 days in solitary confinement – which the UN’s top expert judges may amount to torture – he required urgent medical attention. Rajab was rushed to the Bahrain Defence Force hospital with breathing difficulties, an irregular heartbeat and a weak immune system. After being released by the hospital, and police transferred him to the West Riffa police station. His treatment improved at that facility: Rajab was no longer kept strictly in solitude and allowed more regular phone calls. His family are concerned that his health will decline again and think that this latest transfer suggests a harsh prison sentence will be handed down in October. Rajab faces multiple charges of “insulting a statutory body”, “insulting a neighboring country”, and “disseminating false rumors in time of war”. These are in relation to remarks he tweeted and retweeted on Twitter in 2015 about torture at Bahrain’s Jau prison and the humanitarian crisis caused by the Saudi-led war in Yemen. 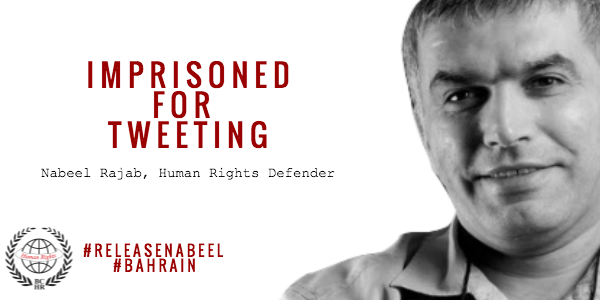 Since 2011, Rajab has faced ongoing judicial harassment and prison sentences for his vocal activism. He was placed on a travel ban in 2014 and has been unable to leave the country.